One of the hallmarks of a Dominican is balance. We strive for moderation in all things. The Very Rev. Brian Martin Mulcahy, O.P., the Prior Provincial of the Province of St. Joseph, said at our 2010 Chapter Retreat, that, “To a Dominican, it is just as wrong to fast on a feast day as it is to feast on a fast day”. Dominicans balance private contemplation and meditation with public ecclesial prayer of the entire Catholic Church. Lay Dominicans attend daily mass if possible and are strongly encouraged to pray the Liturgy of the Hours also known as the Divine Office. The following text is adapted from an insert included with a CD recording of Sunday Vespers with the Dominicans, produced by the Immaculate Conception chapter. “Christ taught us: You must pray at all times and not lose heart (Lk 18:1). The Church has been faithful in obeying this instruction; it never ceases to offer prayer and makes this exhortation its own: Through him (Jesus) let us offer to God an unceasing sacrifice of praise (Heb 13:15). The Church fulfills this precept not only by celebrating the Eucharist but in other ways also, especially through the Liturgy of the Hours. 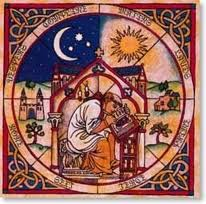 By ancient Christian tradition what distinguishes the Liturgy of the Hours from other liturgical services is that it consecrates to God the whole cycle of the day and the night (GILH 10). In a very real way, what we do with our allotted time is that which makes us who we are. We cannot give our lives to God unless we give him our time. Whatever our state of life may be, we are called to consecrate the hours and days of our lives. “The purpose of the Liturgy of the Hours is to sanctify the day and the whole range of human activity” (GILH 11). The Liturgy of the Hours, also referred to as the Divine Office, is the prayer of the Church with Christ to the Father through the Holy Spirit. Each office is comprised of Psalms, Bible readings, hymns and prayers. All 150 Psalms are sung over the course of a four week cycle. The historical roots of the Office are inextricably entwined with Jewish prayer customs dating back to the Babylonian Exile. Deprived of the temple, the Jews – our elder brothers in faith – gathered in synagogues to read the Torah, chant Psalms and sing hymns of praise. During the Roman Empire, the Jews began praying at regular hours. The Romans divided the night and day into four parts of approximately three hours each. A bell in the forum heralded the first hour of the day, known as prime, at about 6 am. It rang out again for terce, or the third hour, at 9 am. The bell pealed at noon for sext, the sixth hour. After lunch and a nap, the people returned to their work at none, the ninth hour, about 3 o’clock. The long day ended around six o’clock with vespers. At night, the hours became known as watches, the nomenclature still observed by today’s mariners. Compline (night prayer) is read or chanted immediately before retiring. The practice of praying in cycle with the sun, the moon and the seasons is portrayed in the Psalms. Evening and morning, and at noon I will speak and declare and he shall hear my voice (55:17). I rose at midnight to give praise to thee (119:62). Seven times a day I have given praise to thee, for the judgments of thy justice (119:64). Jesus himself prayed to the Father often and fervently, in public and in private; giving praise and thanks, as well as petitions. He also prayed at appointed hours. The work of each day was closely bound up with his prayer, indeed flowed out from it: he would retire into the desert or into the hills to pray, rise very early or spend the night up to the fourth watch in prayer to God(GILH 1:4). After the Resurrection, the early Church continued to gather together to pray. The book of Acts frequently portrays the early Christians praying at appointed hours. Peter and John were going up to the temple at the hour of prayer, the ninth hour (3:1).The prince of the apostles went up on the housetop to pray, about the sixth hour (10:9). ; And at midnight, Paul and Silas, praying, praised God (Acts 16:25). Christians soon added Bible readings and canticles to the community prayer. The general structure of the Office was well established by the fourth century and the modern form, while less complex, is in essence the same as that of the ninth century. The Liturgy of the Hours is for everyone. The Church encourages the laity to pray the Office in parish groups. Families frequently discover that the Office offers not only structure and tradition but ample opportunity for extemporaneous and intercessory prayer. If praying in community is not practical, individuals are urged to read the hours privately. Many of us find Compline an especially restful and peaceful prelude to retiring. The prayer puts both the joys and the trials of the day in proper perspective. The Liturgy of the Hours is a solid foundation for ecumenical prayer. There is no prayer more Bible-based and it is practiced in some form by Jews, Orthodox, Anglican and others who worship the God of Abraham. Most Catholic clerics and religious are required to pray the Office. Secular members of the major religious orders, such as the Franciscans and Carmelites, are strongly urged to pray the morning and evening Office, the two hinges of the liturgical day. For Benedictines, the Office is fundamental to their spirituality. Members of the Order of Preachers, more commonly known as the Dominicans, have discovered that praying the Office is the ideal instrument for integrating the four pillars of spirituality which make members uniquely Dominican: Prayer, Study, Community and Apostolate. Dominican spirituality is based on sharing the fruit of prayer and contemplation. Holy study is an extension or deepening of contemplation and is a vital aid to thoughtful discernment. The Divine Office is the essential prayer that brings the Dominican community together. Holy prayer, study and community inevitably lead to fruitful apostolates. Apostolate comes from “apostle,” meaning one called and sent by Jesus Christ to proclaim the Gospel by word and deed. The fundamental Dominican apostolate is to save souls by bearing Christian witness, proclaiming the gospel and preaching Catholic truth. If a life of contemplation, ecclesial prayer, and holy study balanced with Christian action appeals to you, perhaps you are being called to join the Dominican family. To learn about Lay Dominicans, please email prior@dominicanwitness.com. If you’re a woman in search of a religious community, may we suggest you look at the Dominican Sisters of St. Cecilia (www.nashvilledominican.org). If you are curious about life as a Dominican Friar, go to www.dominicanfriars.org. To learn more about praying the Office, come visit us the third Sunday of each month at the Dominican House of Studies. The Chapter prays the mid-afternoon Office in the chapel after the close of our regular meeting. Please email our chapter Prior for guest information.